Prepare bulgur according to package directions, omitting any salt or fat. Drain well. Steam asparagus in steamer basket over boiling water 3 to 4 minutes or until bright green and crisp-tender. Cool under cold running water, drain well, and blot with paper towels. 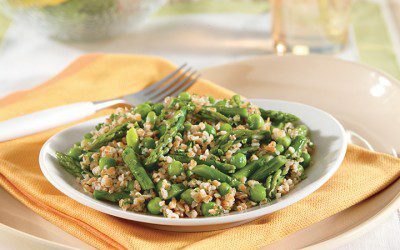 Combine bulgur, asparagus, peas, parsley, and mint in large bowl. Whisk lemon juice, orange juice, oil, salt, and pepper in small bowl. Pour over bulgur mixture; toss gently. Note: Bulgur is a whole grain that’s high in fiber and protein. It’s also a good source of iron, magnesium, and B vitamins. Exchanges per serving: 1 Bread/Starch, 1/2 Fat, 2 Vegetable.